This week Pioneer rolls out two multimedia centres for your car which are specifically designed for playback of music and video from external sources such as iPod, iPhone, USB device, MP3 player and SD cards or other sources via Aux-in. The MVH-8300BT ad MVH-7300 models are equipped with 3-inch colour TFT displays which background and screen colours can be changed, have a 7-way rotary controller, button illumination also can be changed, and give access to all the playlists, album art, videos and more on a connected iPod or iPhone. The two car stereos play MP3, WMA and iTunes AAC music files and features App Mode, which enables listening to music or watching video and navi content from various iPhone and iPod touch Apps, including games, video, internet radio, musical instrument simulators etc. 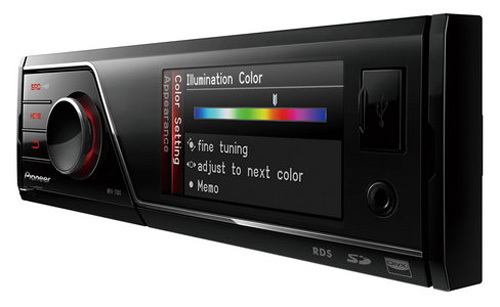 The two digital media receivers are also equipped with 8-band graphic equalizer, Advanced Sound Retriever (ASR) patented technology to enhance the sound quality from compressed digital formats, dedicated hi-volt (4 V) pre-amp outputs for front, rear, and subwoofer, support DivX video playback from SD and USB, and MVH-8300BT even include Parrot Bluetooth module, allowing you to make and receive calls wirelessly. They will be launched in February, but the purchase price was not announced.